My birthday falls at the end of January. A month of cold and damp here and after the excesses of Christmas, it feels like a time to shy away from more celebration. Especially when you´re suffering from bronchitis like I was. Big Man asked me what I wanted to do to celebrate my birthday and I told him I wanted to be like the Queen of England and celebrate on a second date, preferably when the weather was warmer. Anyway, last year he surpassed himself and surprised me with our rescue puppy, Luna, so I didn´t think a bottle of perfume or a box of chocolates was going to tick the boxes for me. Selfish moo that I am. The local town hall often organises “cultural activities” for the village folk, not something I have ever been interested in. Probably a bit of smug self importance creeping in, thinking I´m already culturally aware enough already and mixed with a healthy dose of a severe fear of group activities of any kind. When Big Man surprised me (again!) on my birthday by telling me that we were going to join 35 other villagers on a three day trip to Tangier at the end of February, I wasn´t really sure what to think. It´s a destination I´ve always wanted to visit, but Big Man had always said it didn´t interest him, and we both hated anything that involved coaches and tour guides. I decided to keep an open mind about the whole thing, dose myself up with cough medicine and make Falafel to get us in the mood. 2 level tablespoons of flour plus extra for dusting. This is a dish which is very fast to prepare if you have a food processor. It took me longer to wash up than to whizz the ingredients. It can also be done by hand with a potato masher and a bit of fine chopping and mixing in a large bowl. Put all of the ingredients apart from the oil and serving suggestions in a food processor and whizz them up for about 30 seconds then pulse until they reach the texture of grainy, wet cement. If it looks really sloppy add a little more flour but it will still be fairly wet when it´s ready. Add salt to your taste. Put a couple of tablespoons of extra flour in a bowl and drop in a heaped tablespoon full of the chick pea mixture and using two spoons get it lightly covered in flour. 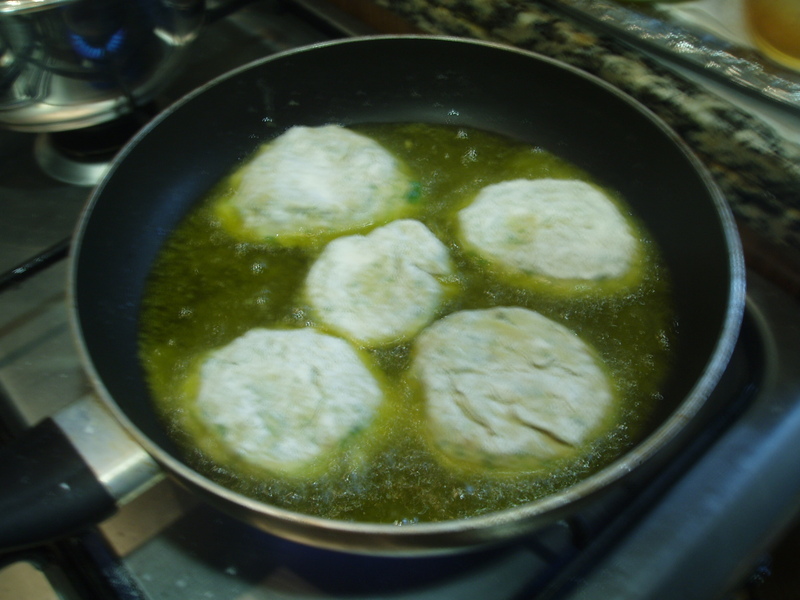 If you can work quickly just drop this straight into your frying pan of hot oil, or if you prefer to work more slowly, prepare the falafel first and put them onto a plate, then heat the oil and drop them in. Make sure your oil is hot, let is start to smoke then turn the heat down slightly. You only want to get a nice crust to the outside, the chick peas are already cooked. Flatten the balls of mixture down as you put them into the pan and after about a minute flip them over (but make sure they´re nice and browned first). The second side will take slightly less time, so just check on them, take them out and place onto kitchen paper to blot the excess oil and you´re ready to serve. 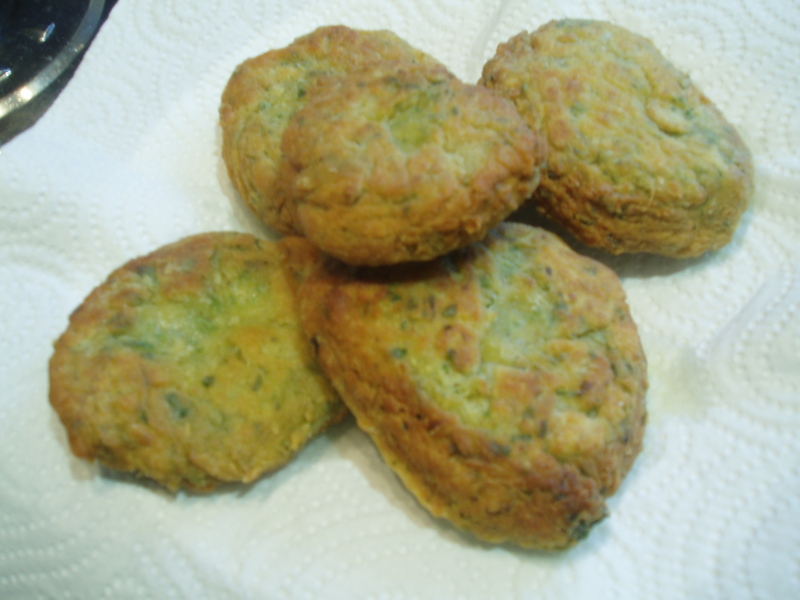 They´re great with a squeeze of lemon juice then stuffed into pitta bread with some finely chopped lettuce and mint and a spoon full of natural yogurt mixed with an equal quantity of mayonnaise. I´m not sure how authentic that is – but it´s delicious! The Missing Falafel was Eaten By The Chef! Never had, but they sound and look good….Raedi My Birthday is Jan 31, yours? Jan 31st too! I think we did this already, but found it unread in my email posts! They do look delicious! We did this last year – it decided to send itself out again for some very unknown reason! Oh now these hark back to my days working in London. I often used to have them for lunch. I’m not sure what my little corner of Lancashire would make of them but they are delicious. I’m sure your trip will be fabulous. It did! Did you have fun? I’m always happy to see what’s happening in your world. It was incredible and you know, I never posted about it…could soon change that! I have phases of making it – this recipe works well for me! Am not quite sure why this post (which is a year old) has sent itself out..maybe it wanted some attention?! I love falafel – there’s a great place in Paris which serves it in pita bread with hummus and slices of roasted aubergine – soooo good!! Looks like you had a great meal here – Last time I tried to make it they all fell apart alas 😦 Need to give it another go! They can fall apart sometimes, it´s just the way it goes. The ones you mention sound fantastic!